Founded by Touria El Glaoui in 2013, the fair returns to Red Hook, Brooklyn with 21 galleries exhibiting more than 60 artists from Africa and the African diaspora. This year there is a distinctly female vibe. Among the artists showing special projects at the fair are Alka Dass of Durban, South Africa, and Stacey Gillian Abe of Kampala, Uganda, the winner and runner-up, respectively, of the 2017 Young Female Residency Award, presented by The Project Space in Johannesburg. And the third iteration of the fair’s New African Photography section focuses solely on young, female photographers. Art New York returns to Pier 94 with more than 1,200 artists showing with around 85 galleries from 30 countries. Context returns as well to present more tender talent. Among them is the art zine Vellum Projects’ presentation of Diana Wege’s ongoing series Reject Violence Prints, which use the typography and design of street advertising to call for an end to violence. On the last day of the weekend, London’s print publishing art fair pops up in New York with beer, books and other printed matter, as well as live performances. Free and founded on a DIY ethos, the punk fair promises “an opportunity to engage in the past, present and future of pop culture”. A funkier fair, Fridge takes pop culture treats as its theme this year, titling the sixth edition Tonya’s Tasty Triple Axel Icebox Cake Featuring Ziggy’s Stardust Powdered Donuts. Attendees are invited to honour the legacies of both David Bowie, by participating in the Bowie Interactive Post-It Project, and the legendary drag queen Daniel Booth, aka “Sweetie”, with a screening of the documentary A Charmed Life. London’s contemporary urban art fair arrives in Brooklyn with a carnival theme and 27 exhibitors. UK street artists are well represented, including D’Face who has created an outdoor mural and Insa with the immersive installation “temporal infinity”. They are joined by solo shows for European street artists like Berlin’s Vermibus, Paris’s Bom.K and Brusk, as well as New York City’s own ASVP and Skewville. Look out for the intersectional feminist “bruja” rapper from the Bronx, Princess Nokia, who will play the official after-party at the Brooklyn art and music space Elsewhere. The petite East Village space is hosting its 20th mini-fair with six fellow galleries, four from Paris (where Zürcher also has an outpost), one from Brooklyn and one from Brussels. With just 12 artists total, the salon style installation offers an “intimate alternative” to the main event. This fair opens in the Meatpacking District with 75 New York and international exhibitors, 70% of whom are women. These include the 12 female artists shown by the Ceres Gallery in Chelsea, a feminist non-profit space, and an exhibition of work by teenagers from the Lower Eastside Girls Club. 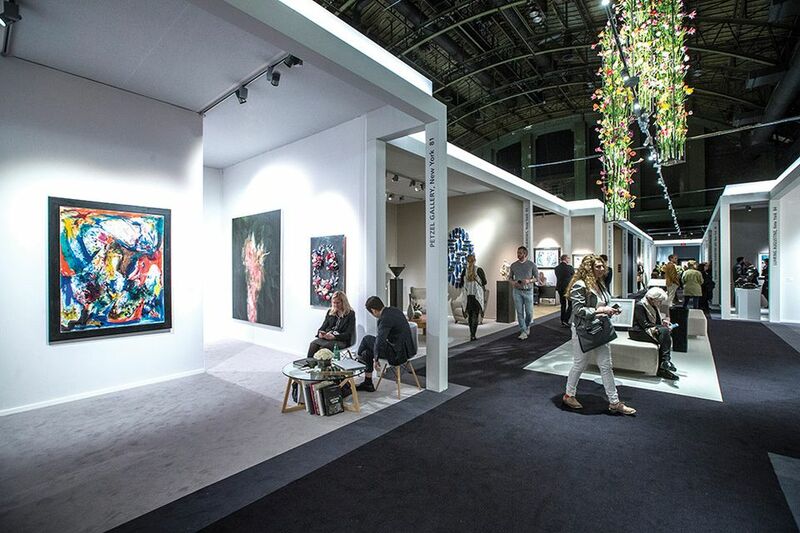 Tefaf’s spring edition returns to the Park Avenue Armory with 90 dealers and a Modern and contemporary art focus. Its cultural programming also returns, with museum directors, curators, collectors and other notable leaders in the international art world holding Tefaf Afternoons and morning Coffee Talks, including Creative Intersections: Socially Engaged Art and Institutions.